All the students moving ahead of their graduation need to be prepared with adequate Career Research with a career planner or search related to all the available options for their future Career Research project. Prudent and sensible individuals are the once who look forward to this progression in early career days as a career fresher. Schoolanduniversity.com understands that finding an appropriate career advisor is so very much difficult and also the importance of career planning; hence the experienced and dedicated experts at schoolanduniversity.com have compiled a Career Research article which helps you with some handy tips about conducting Career Research. One can consider it to be a Career Research worksheet or may be a career advice questionnaire. Basic helpful information would be regarding where have the other graduates from your class/year/stream joined and what is it exactly that they are doing? Seek details on the classmates/graduates who were been mentored by your supervisors because they also can help you show correct career path. Graduates; senior to you are of high importance as they are the kind of bridge between you and the past seniors who have been able to establish themselves in their careers so far. Your immediate supervisors are also of great help as they can guide/advise you on suggested career paths and the career paths chosen by the past students under their supervision. One can seek information on career alternates in a particular stream through Scholarly association’s web site. Such web sites are often happy to discuss the queries or career related issues vide e-mail or chat rooms. Individuals have the benefit to attend Career workshops arranged by these associations in the early days of graduation; leaving you with ample time to decide on the next course of action. Once the alternatives are listed down; comes the next step in Career Research for students and that is of playing mock role with your own self. Visualize yourself performing in each career considering both the positive and negative aspects of each option. Such mental pictures will help the option look familiar helping you to not get rejected due to the strangeness of the option. At times it also happens that post a second thought you come up with an option that is out of your academic league and this is the situation where one needs to play safe and wise to look for a supervisor who is resourceful enough with context to the field you wish to work. Initial source of information can be a professional website followed by an interview; as nearly all the websites publish the profile related details on their websites and detailed description is available during the interview process. This also happens to be a source of Online Career path. This proves to be an inception of Post graduate career opportunities. What satisfies you the most about your career or occupation? Why? What frustrates you the most about your career or occupation? Why? What are the recommended changes; if one could? 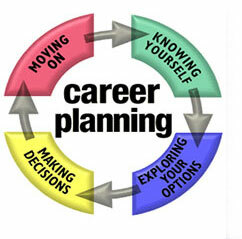 Has your career planning affected your personal life? How? Most challenging aspect of your job? What is it different that successful do; other than who fail at this job? Suggested recommendation of a different individual on views of the same career? The best career advice from our team of experts “Negative and positive aspects carry are equally important for reviewing any particular occupation or profile”. The interaction has to be precise and crisp followed by a thank you and appreciation on the valued time & opinion shared by the individual; at the end of the conversation. Assisting some professional for few days in order to know the requirements of the profile/occupation. Summer jobs or part time assignments also prove helpful. Internship serves better; in case there are no time constrains. Winning over the hurdles to get relevant experience of the profession is worth investing. You may be looking for careers fresh market or careers fresh easy; during this tenure there are chances that one develops contacts in the job market which prove beneficial in a longer run. Media, may it be print or electronic; has been actively instrumental in the ever evolving job markets. Printed and online information is readily available at different student development and educational portals. Public libraries and career centres play vital role in providing such information. Such sources are the ones which share valuable directions in exploring strategies for better career options. Labour market trends tend to change dynamically and hence a thoughtful approach to such details is mandatory. The facts and figures gathered from different sources that we discussed in the above topic should help an individual to look out for exact skills required for the kind of job profile you want as a post graduate career option. For instance if one is interested to build up a career in Business management, Business administration, Business administration in Finance or IT management, read through the resumes and publication records of the individuals who have been hired in the recent past for the position you desire and that too in the departments you would want to work. For some post graduate career seekers who have pre planned to succeed; the above skills list would resemble a lot with what one used to do to achieve the perfect academics. Growing further in the profession will required enhanced and different skill set; but the basics will always remain same. Post graduates who have worked on enhancing these skills while their graduation period feel privileged once they enter the job market; simultaneously a constant effort of converting the graduate experience in a form where the future employer can co relate it with the organizational needs. Some good examples could be where graduate students can supervise undergraduate Business administration student’s projects, exam papers and such segments, which; eventually can be added up as supervisory experience to future employers. Crystal clear understanding of the vocabulary and specially the culture helps an individual to considerably convert graduate experience in relevant organizational needs. Start short listing the compiled list and bring down the choices to may be five to seven career options which you are really interested to explore further. Criteria which are on priority for you such as Income, Job Security, Social value etc should be used to curb down the count of options. The first step in decision making is to decide what is to be decided...Confusing? The process also is this confusing. General tendency is to have maximum available options and more and more things to be worked out while you move ahead. Individuals who are not able to decide even after serious efforts or are in their early years of graduation they should give some more time to try things to select one of it or may be put in extra time and efforts to take a taste of all and then decide on to the final career option. Any decision or strategy or plans put in action not only in Career planning, elsewhere also; is likely to succeed only with checks and balances in form of regular reviewing the action plan; followed by a decision to plan something more towards the journey to success. Reviewing your decision at regular intervals will give you the chance to opt for alternatives which might be more beneficial based on relevant experience and information gathered. How will I benefit optimum of this career choice? What price am I paying to opt for this career choice? Considering my positives and negatives what chances do i stand to get this career choice? How does my selected option stand the comparison with other career options? In process of seeking information from experienced personnel about post graduate careers; make sure to not to get over influenced by their thought process of what they think is best for you. Equip yourself and do your own Career forecast.